Although we need to arrive at an operating model that allows for autonomy, mastery, and purpose, we need to balance it with mechanisms for accountability and alignment. 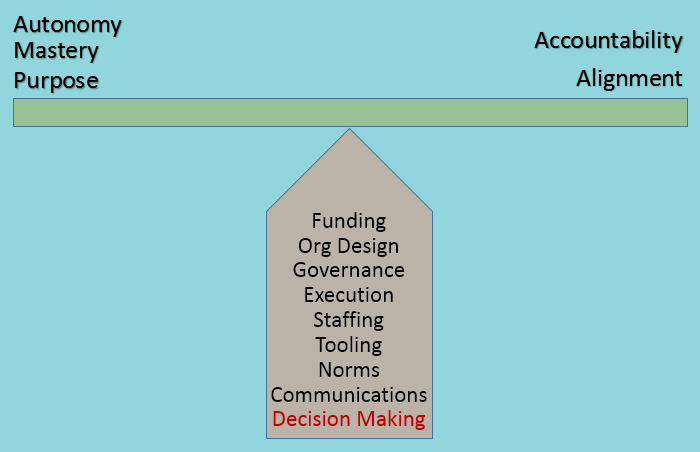 This has to be done for each dimension of the operating model. In the area of decision making, we allow for autonomy by letting outcome owners have decision rights while others who support the outcome have input rights. That said, we have to ensure that people with decision rights do not disregard the opinions of those with input rights. 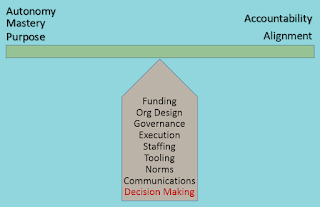 Decision records are the balancing act. They provide a transparent audit trail for important decisions. Recently, Michael Nygard of Release It fame argued for architecture decision records. That's one more reason to consider them.